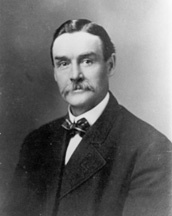 CRAWFORD, Coe Isaac, a Senator from South Dakota; born near Volney, Allamakee County, Iowa, January 14, 1858; attended the common schools and was instructed by a private tutor; graduated from the law department of the University of Iowa at Iowa City in 1882; admitted to the bar and commenced practice at Independence, Iowa; moved to Pierre, Territory of Dakota, in 1883 and continued the practice of law; prosecuting attorney of Hughes County in 1887 and 1888; member, Territorial council 1889; upon the admission of South Dakota as a State was elected as a member of the first State senate; attorney general of South Dakota 1892-1896; unsuccessful Republican candidate in 1896 for Representative at Large to the Fifty-fifth Congress; attorney for the Chicago & North Western Railway Co. for the area around South Dakota 1897-1903, when he resigned; moved to Huron in 1897; Governor of South Dakota 1907-1908; elected as a Republican to the United States Senate and served from March 4, 1909, to March 3, 1915; unsuccessful candidate for renomination in 1914; chairman, Committee on Expenditures in the Interior Department (Sixty-first Congress), Committee on Claims (Sixty-second Congress); resumed the practice of law in Huron, S.Dak., until 1934, when he retired from active business and political life; died in Yankton, S.Dak., April 25, 1944; interment in Municipal Cemetery, Iowa City, Iowa. Armin, Calvin P. Coe I. Crawford and the Progressive Movement in South Dakota. South Dakota Department of History Report and Historical Collections 32 (1964): 26-321; Meyer, Edward L. Coe I. Crawford and the Persuasion of Progressive Movement in South Dakota." Ph.D. dissertation, University of Minnesota, 1975.